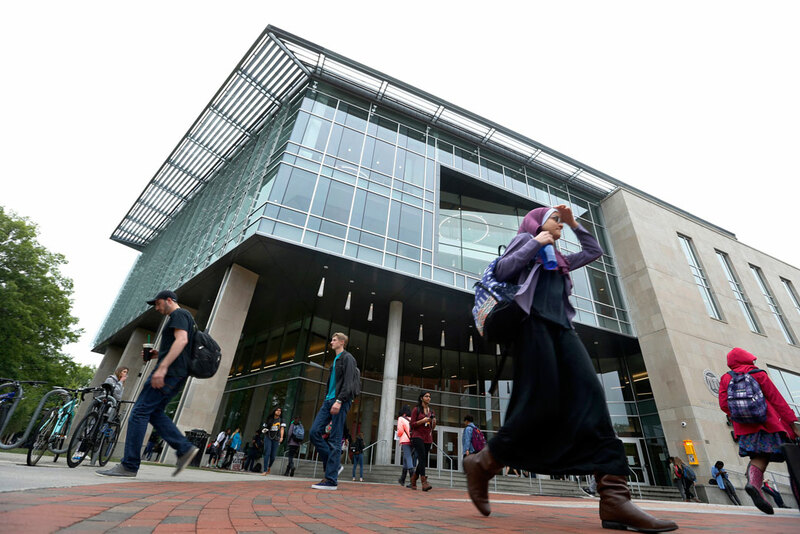 Students walk by the James Branch Cabell Library at Virginia Commonwealth University in Richmond, Virginia, on April 28, 2016. CAP’s new plan for colleges to take responsibility for their student loan failures balances accountability and equity through a system of risk-sharing payments and bonuses. Note: On January 13, 2017, the U.S. Department of Education announced a correction to its repayment rate calculations that resulted in changes to the final rate for most institutions. The error in the original rates undercounted the number of students who had failed to pay at least $1 of principal balance, thus inflating the numbers. Because its publication was before the department recognized and publicized the correction, this report uses the original, uncorrected repayment rates. But the colleges and universities that borrowers attended will almost never face consequences for their students’ loan struggles.4 This is the case even where these institutions failed to offer a worthwhile education. That’s not fair. Borrowers are not the only ones who benefit from student loans. In order to operate, the schools that borrowers attend depend to a great degree on the flow of federal dollars. Without federal loans, thousands of colleges across the country would likely shutter their doors. In this report, the Center for American Progress proposes a new vision for institutions to share in the risk of federal student loans. Requiring universities to put skin in the game would give them stronger incentives to design their educational offerings, support services, and financial policies to send borrowers into the wider world with a meaningful chance of success. This vision also includes a proposal for establishing a system of financial bonuses that would reward institutions that do an exceptional job of serving vulnerable students. This bonus system is a crucial component of counteracting the significant potential downsides of a risk-sharing system. Any outcomes-based accountability system has a very real risk of creating unintended consequences. Of foremost concern is the possibility that institutions could be discouraged from enrolling vulnerable students on the grounds that they may be more likely to struggle with debt. Rewarding institutions when they choose to serve these students—and do well by them—provides a counterweight to these otherwise undesired incentives. This matters because if concerns of improving equity and protecting access for underserved students are not addressed properly, then a risk-sharing system may end up doing more harm than good and should not be pursued. Institutions would pay back a portion of students’ loan balances when one of two negative financial outcomes occurred within five years of entering repayment: (1) default or (2) failure to repay on a reasonable schedule. The system includes one other specification. Instead of paying back portions of loans based upon a school’s overall default rate, the risk-sharing amount required of institutions would get calculated for separate groups of students based upon whether they dropped out or graduated. The latter category would be further broken down by the type of credential earned. In other words, if the default rate was higher for students who dropped out than it was for graduates, then the school would pay back a larger share of those affected balances. This approach is important because it draws direct attention to the connection between noncompletion and loan struggles. The bonuses that reward schools for serving at-risk students would use a different approach. A school’s eligibility for a bonus would be tied to the difference between its actual five-year loan repayment rate and an estimated rate determined through a predictive model. This model would adjust for things that the school can control, such as its size and the predominant degree that it offers, as well as circumstances that the school cannot control, such as the state in which it is located, the unemployment rate of its surrounding county, and whether it is a minority-serving institution—such as a historically black college or university, a Hispanic-serving institution, or a tribal college. Schools that exceed their predicted repayment rate by at least 10 students and 3 percentage points would be eligible for a bonus. They would also be able to receive a bonus for Pell Grant borrowers through a similar process. The actual bonus amount would be paid out on a per-student basis. An institution would receive a payment of up to $5,000 for every repaying student beyond the number anticipated based upon the estimated rate. Each Pell Grant recipient repaying beyond expectations would be worth up to $10,000. The per-student award would be biggest for institutions that receive the lowest tuition revenue on a per-student basis. This acknowledges that institutions that receive less in tuition have fewer resources to work with, and are thus more impressive when they demonstrate success. Estimated effects of this system suggest that this proposal strikes an appropriate balance between incentives for improvement and reasonable expectations. In general, public and private nonprofit four-year institutions would face minimal risk-sharing payments. At public four-year schools, this is due to the fact that payments would be a small proportion of their loan volume. By comparison, nonprofit institutions would tend to pay very little because they perform adequately with students who are expected to do well in terms of loan outcomes based upon their backgrounds. Nearly half—45 percent—of public two-year colleges are estimated to receive a net bonus payment. Among those schools, half would receive an amount equal to 7 percent or more of their average annual federal loan volume. Of the 55 percent of community colleges estimated to make a risk-sharing payment, half would have a payment equaling less than roughly 2 percent of loans received. This amount is even smaller when considering the very low borrowing rates at these schools. Private for-profit colleges, meanwhile, would face the largest risk-sharing payments as a share of their loan volume. Roughly three-quarters of such schools would have to make a payment, with half of them owing an amount equal to at least 3 percent of their annual loan volume. About a quarter of for-profit schools would earn a bonus, but at smaller dollar levels than in other sectors. Overall, this system would create strong incentives for colleges to consider how every student performs, especially those who drop out with debt. It also would reward schools that successfully use federal loans to promote opportunity. The result would be a loan program that better leverages tax dollars to help students build productive middle-class lives, while also protecting taxpayers from underwriting failing institutions. In addition to “Sharing the Risk,” the Center for American Progress commissioned seven other individuals to construct their own proposals for a federal student loan risk-sharing system. Authors had complete editorial independence and their ideas and suggestions do not necessarily reflect the opinions or views of the Center for American Progress. Below is a short summary of each of the papers and a link to where they can be found. Proposal: Webber proposes a risk-sharing system where institutions would be responsible for 5 percent of the balances for borrowers who are not making progress repaying their loans within two years of entering repayment. He also proposes a bonus payment for each student who successfully graduates and repays their loans. His proposal also models the interaction between risk-sharing payments and tuition levels. Read the paper here. Proposal: Hillman proposes a system that uses measures of student loan default and non-repayment, each adjusted by the percentage of students at a school who borrow. Institutions would be asked to repay between 5 and 15 percent of the balance of loans received if they had results far outside the norm of similar schools. His paper also provides a detailed look at the characteristics of the institutions that would make risk-sharing payments under his system versus other models suggested by members of Congress. Read the paper here. Proposal: Klor de Alva and Schneider propose a system that would be applicable to any institution where more than 25 percent of students borrow. Institutions would make a risk-sharing payment of up to 30 percent of the value of loans in default based upon a combination of their three-year cohort default rate, up to 20 percent, and the graduation rate of students receiving Pell Grants, up to 10 percent. Institutions where at least half of students receive need-based federal assistance; spend a lot on education, retention, and career services; and make progress on a student loan management plan would be able to reduce their payment as much as 50 percent. Read the paper here. Proposal: Risk-sharing proposals traditionally focus on long-term repayment metrics, but Blagg and Chingos expand the concept to include short-term metrics focused on completion. Specifically, they propose a risk-sharing system that modifies current rules around returning aid when students drop out in the middle of a term. Under their proposal, institutions would return half of federal student aid used to pay for tuition and fees when a student dropped out before the middle of a term and 25 percent for those who dropped out before the end of the term. In addition, institutions would lose access to the federal aid programs if a large share of their students receiving these funds ended up earning poverty wages after leaving the institution. They also propose changes to the disbursement of financial aid for living expenses so students who drop out do not end up with as much debt. Read the paper here. Proposal: TICAS proposes an accountability system, including risk sharing and rewards that phases in over time based on a borrower-weighted debt outcome measure. Colleges that perform well receive financial rewards based on their low-income student enrollment and/or nonfinancial rewards. Colleges that struggle would make progressively higher risk-sharing payments—5 to 14 percent of the volume of defaulted loans—depending on performance. Colleges with unacceptably poor outcomes would lose access to federal financial aid. Performance thresholds would be fixed, not relative, meaning all schools would be held to the same standards. College outcomes could be measured using one of two options: either the Student Default Risk Indicator, or SDRI, which is a school’s cohort default rate multiplied by its borrowing rate, or the Student Non-Repayment Risk Indicator, or SNRI, which is a school’s non-repayment rate multiplied by its borrowing rate. Read the paper here. Proposal: The authors propose a new federal student loan risk-retention model. They caution that a punitive risk-retention framework only works as a fail-safe mechanism against extreme institutional subpar performance, and argue for pairing any risk-retention policy with a positive incentive for enhancing quality such as an institutional bonus system for better-than-expected outcomes. Their model distributes progressively larger financial liabilities to institutions that produce increasingly poorer borrower repayment patterns. The authors call for identifying and separating the social-policy costs of student lending—such as promoting access and opportunity—from costs that are reasonably attributable to program quality. They advocate for allocating policy costs to the federal government, while assigning a portion of quality costs—as measured by repayment patterns—to the institutions themselves. Their proposal would provide an allowance for institutions that enroll large proportions of low-income students. They suggest institutions only face risk related to spending for noninstructional purposes, helping institutions that devote larger portions of their budgets on instruction. Read the paper here. Paper data here. Proposal: Akers proposes a system of risk-sharing in which institutions pay a premium to the Department of Education to cover the cost of providing loan repayment safety nets to their former students. She argues that risk-sharing should be used to correct the perversion of incentives created by repayment safety nets in the federal lending program. And that risk-sharing as a punitive mechanism would be ineffective. Read the paper here. Almost no school ends up facing sanctions due to high student loan default rates. What’s more, the current system’s thresholds create sharp cliffs. A school with a default rate of 29.9 percent for three consecutive years faces no problems, while one with a rate that is one-tenth of a percentage point higher over the same time period loses access to all federal financial aid. As a result, only those schools near the threshold have any incentive to change. Even then, schools need only change enough to leave the penalty range. To build an ideal risk-sharing plan, the Center for American Progress started with the idea that institutions should be on the hook for some portion of a debt balance every time a student loan goes bad. The amount for which a school is accountable should be determined through a clear process and should factor in the amount of problematic debt in addition to the rate at which problems occur. Financial consequences must also be carefully calibrated to encourage improvement but not force widespread closure of institutions. Questions of overall eligibility for the aid programs are better handled through the establishment of rigorous minimum performance standards. Last, but by no means least, the system must contain strong protections for access and equity—issues addressed in the next section on bonus payments. Here is how those principles translate into a system for risk sharing. Student loan default is a substantial concern, and CAP’s system would place institutions on the hook when it occurs. But default is not the only negative borrower outcome. Individuals who make no progress toward retiring their debt are also of great concern. Borrowers who are either severely delinquent or are making no payments, thanks to options such as deferment or forbearance, are potentially on a road that leads to default, and the risk-sharing system should take their outcomes into account. Taxpayers may also face costs when an institution has an extensive number of struggling borrowers in income-driven repayment. These plans make a borrower’s monthly payments equal to a set percentage of their discretionary income—an amount that for low-income people may be $0.15 Even among borrowers who are making monthly payments, if they make too little money, their loan payments will be insufficient to cover accumulating interest. Therefore, CAP’s system would also include a repayment rate measure to capture the range of negative debt outcomes that go beyond default. This indicator would consider whether students have paid back enough of their balances to retire their debt without excessive interest accrual or receipt of forgiveness through income-driven repayment. Under this formulation, borrowers who are not in default but who are also not paying down their loans would count as failures because the accumulating interest on their debts will cause their balances to grow. Existing repayment measures tend to look at whether borrowers have paid enough so that their current balance is at least $1 less than what they originally owed.17 But borrowers should have paid down far more than $1 after several years in repayment. This risk-sharing system would use a higher bar. What a borrower owes should be compared with what someone with the same debt and interest rate would owe after five years of repayment if that borrower was going to pay off a debt in equal installments over 25 years. This system suggests using 25 years because it is longest a borrower can pay on an income driven plan before receiving forgiveness.18 Borrowers who owe more are considered nonrepaying on the grounds that they are either accruing excessive interest or are headed toward loan forgiveness at the government’s expense. The theory of overborrowing leading to default also conflicts with other studies that show a substantial connection between dropping out of college and defaulting on loans. For example, a 2015 study of default at community colleges in Iowa found that 43 percent of all defaulters in the sample owed less than $5,000, and more than 75 percent took out less than $10,000.21 Results such as these strongly suggest that what triggers default is not the size of the debt but rather the circumstances of a borrower. That being said, listed below are some circumstances where adjustments to borrowing rules may better serve borrowers. These fixes would address loan challenges more effectively than giving schools the ability to limit loans selectively—a practice that could lead to redlining or pushing borrowers into more expensive private loans. Connect loan limits to credits attempted. Currently, borrowers are allowed to take out the maximum amount of available debt as long as they enroll with at least a half-time course load—defined as six credits in a semester or the equivalent. This allows part-time students to borrow as if they were enrolled full time. This is noticeably different from Pell Grant awards, which are tied to credits attempted. Tying loan limits to credits attempted would thus better reflect aid-awarding rules for the rest of the federal system. Adjust loan limits based on credential level. Right now, borrowers enrolled in a certificate program can take out the same amount each year as borrowers pursuing a bachelor’s degree. Given that most certificates provide a lower return than bachelor’s degrees, it makes sense to provide flexibility to set different loan limits based upon the credential level. Importantly, loan limits should not vary by program within a credential level due to concerns about complexity and the fact that students may switch programs. Preserve aid officer flexibility. Financial aid officers currently have the ability to adjust loan limits on a case-by-case basis.22 The Department of Education should issue additional guidance to ensure that aid officers know they can make use of this ability. One of this risk-sharing system’s central goals is to set payments in a way that would create a stronger link between college completion and student loan accountability. Recent studies and one review of the literature find that finishing a degree is among the strongest predictors of whether students are likely to default on their loans, and it is still an important determinant after controlling for other student and school characteristics.23 This strongly suggestive evidence of a causal link between completion and the risk of negative loan outcomes means that colleges should be acutely aware that academic improvements may also be the fastest path to shrinking the payments of the risk-sharing system. To establish the link between completion and risk-sharing payments, this system would break down each institution’s undergraduate borrowers into five groups: (1) dropouts, (2) certificate completers, (3) associate degree completers, and (4) bachelor’s degree completers. Students completing or dropping out of graduate programs would be in their own categories. It is likely that a borrower who defaults on a loan will also fail to repay it. Requiring an institution to pay back a share of the balance in both cases would be akin to double jeopardy—charging a school twice for the same problem. This system would avoid the double jeopardy concern by first calculating risk-sharing amounts tied to default, then removing defaulters from the repayment rate calculations. Here’s how that works: Each attainment group within an institution would first have its default rate and total amount of defaulted debt calculated. This would form the basis of risk-sharing amounts tied to default. The repayment rate calculation would then exclude any defaulted borrowers and loan amounts from repayment rate calculations. This system would tie the share of problematic loan balances that an institution must repay to the rate at which the unwanted result occurred. In other words, an institution would pay back a percentage of dollars in default equal to the default rate. So if an institution’s dropouts have a default rate of 15 percent and defaulted loans totaling $100,000, then the school would make a payment of $15,000. Calculating the amount of affected dollars under a nonrepayment rate is a bit more complicated. In this case, the total amount of dollars of which an institution has to pay a portion would be equal to the difference between the total amount of money that a school’s borrowers within each attainment category should still have outstanding after five years in repayment and the amount they actually owe. In other words, if the borrowers who dropped out and did not default should have $200,000 outstanding and they actually have $250,000, then institutions would have to pay back a portion of that extra $50,000. The share of nonrepaid dollars for which a school is on the hook would be based upon the rate at which borrowers who did not default owe more than expected after five years in repayment. This means that if 20 out of 100 borrowers not in default owe more than what they should, institutions would have to repay 20 percent of the amount of nondefaulted loan dollars outstanding that borrowers should have paid back already. To continue the example above, that would be 20 percent of $50,000, or $10,000. Because borrowers who repay much more than expected help reduce the nonrepayment risk-sharing amounts for schools, it is possible that there would be situations where a high percentage of borrowers will not have repaid but the total outstanding balance will be lower than expected. In that case, institutions would face no risk-sharing payments for that group of borrowers. 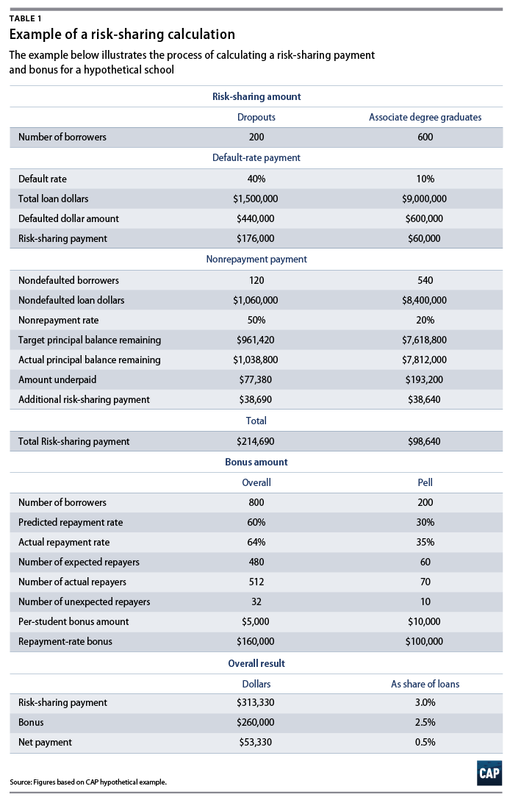 The sum of all risk-sharing amounts for default and nonrepayment across every borrower attainment group would represent the total payment for a school. Establishing a clear connection between the institutional risk-sharing payment and the rate at which problems occur would create immediate rewards for improvement. Each incremental decrease in a default or nonrepayment rate made by a school would automatically result in lower payments. It also would establish a payment system where it is very clear how risk-sharing amounts get calculated. Similarly, any implementation of this plan should consider whether there is some size of risk-sharing payment that is too small to merit collecting. For example, a risk-sharing payment of $100 would clearly not be worth the federal government’s time and energy to obtain. Department of Education staff should determine the exact point where the value of the payment exceeds the cost of collecting it. This tiered payment approach based upon two negative outcomes would balance simplicity and nuance, while putting a focus on borrowers who are most likely to struggle. Understanding the payment calculation would not require any complex input adjustment or other opaque processes that would make it hard for colleges to predict outcomes. The path to improvement would also be quite clear—fewer students defaulting or failing to make reasonable progress paying their debt would mean lower payments for schools. Not only are dropouts more likely to have problems with their loans, but students in this group also tend to come from more at-risk backgrounds. One study found that nearly 40 percent of black or low-income borrowers drop out versus around 30 percent of white borrowers and less than one-quarter of higher-income borrowers.27 Students take a big gamble when they borrow, and dropping out means they decisively lose their bet. Because a high rate of noncompletion is at least partly the fault of the institution, it should share a portion of the risk. One might worry that calculating separate risk-sharing amounts based on attainment status could result in excessive payments when certain completion groups have especially high default rates. This is unlikely, however, because defaulters in general, and dropouts in particular, tend to have small loan balances. For instance, an analysis of loan data by the Council of Economic Advisers found that more than one-third of defaulters owed $5,000 or less, while two-thirds owed $10,000 or less.28 These numbers are a far cry from average loan balances for bachelor’s degree graduates of around $30,000.29 Thus, even if schools end up paying a large proportion of such balances, the final payment would still be relatively small. The role of financial consequences in any risk-sharing system is not to raise money or to put a college out of business. Instead, money is a tool to get institutions to understand that they play a role in the repayment of student loans and incentivize schools to behave differently and lessen the risk of failure. As a result, the government need only make the payments large enough to change institutions’ behavior. This payment system is designed to produce financial results sufficiently large for institutions to notice but small enough to avoid creating unintended consequences. Because the amount schools pay would be tied to the rate at which loans fail to perform, it is extremely unlikely that they will end up paying the full amount of problematic debt. Similarly, schools will likely end up paying higher percentages of balances owed by those with the lowest debt amounts—dropouts—and lower percentages of loans borrowed by those who owe the most—graduates. By far the biggest concern about any risk-sharing system is that colleges that do a great job with vulnerable students will be judged unfairly. A risk-sharing system must not discourage schools from offering educational opportunities to those who need them the most but might not seem like the safest bet for repaying their loans. If the system creates this outcome, then it is a failure and should not be implemented. CAP’s bonus system, detailed below, would answer this challenge and allow institutions that beat the odds to shine through. Any risk-sharing system cannot be implemented without some sort of bonus for institutions that serve at-risk students well. While the fact that all institutions would face risk-sharing payments if their students default could prove to be a political obstacle, this system would assure students that their school had an incentive to improve. The conventional federal approach is to hold accountable only the worst actors—a design that limits the number of institutions facing consequences. The fact that fewer institutions are implicated under traditional approaches also means that fewer institutions and lobbying organizations are motivated to block the accountability system. But risk-sharing systems are about more than just accountability for the worst, and an effective plan needs to go further. Because schools create default risk but currently do not bear any of it, risk-sharing systems strive to alter the relationship between schools and the federal government to send a signal that improving loan performance is everyone’s business. Even schools that do well by existing default rate measures may still have dozens, if not hundreds, of distressed borrowers. Policymakers should care about their struggles, and institutions should share in the financial consequences of students’ dashed educational dreams. If institutions are going to share in the risk of the student loan system, they must be rewarded for producing successes. Providing these bonuses is also an important tool that the federal government could use to shrink or eliminate risk-sharing contributions for institutions that succeed in serving disadvantaged student populations. In this way, institutions would not be dissuaded from serving these individuals. This system proposes that any bonus amount earned would be subtracted from required risk-sharing payments. This means that a bonus would reduce a risk-sharing payment and, in many cases, result in additional money for a school. Bonus eligibility would be simple: Institutions that outperform repayment expectations—overall and/or for Pell Grant recipients who borrow—would receive a monetary reward for their results. More specifically, an institution would receive a bonus for each student repaying loans after five years beyond the expected number. In other words, if a school is expected to have 100 students repaying loans and actually has 150, then it would receive a bonus for 50 students. The size of the per-student bonus would vary based upon an institution’s affluence as measured by the amount of tuition it receives per student. The poorest schools would receive up to $5,000 per student, with the richest receiving $750. Rewards would be doubled for Pell Grant recipient borrowers who exceed expectations, resulting in bonuses of between $1,500 and $10,000 per student. Figuring out a school’s expected repayment rate would be the most complex part of the bonus system. The goal of an expected rate is to create a reasonable expectation for a school’s performance, given the students it serves and the other contextual factors affecting student outcomes. To do this, the system would start with creating a model that estimates what a school’s repayment rate should be—both overall and for Pell Grant recipients who borrow.30 This model should draw upon a combination of public federal data that schools report to the Department of Education, administrative data held by the Federal Student Aid Office, and local economic information from the Bureau of Labor Statistics. It must include factors within and outside the control of a school that may contribute to better or worse student loan outcomes and that are not directly related to the quality of education offered. For example, factors such as an institution’s state or local unemployment rate would go into the model as outside factors because those conditions could affect the environment in which students try to find the jobs needed to pay back their loans. Similarly, the model should also include factors within a school’s control, such as the racial, gender, and socioeconomic makeup of the student body. It also needs to incorporate an indicator for whether a school is in any of the recognized categories of minority-serving institutions that the Department of Education uses as a way of acknowledging the historic role these types of schools have played in expanding opportunities for students of color. These schools include historically black colleges and universities, Hispanic-serving institutions, and tribal colleges, among several others. The next step would compare an institution’s predicted repayment rate with the actual results achieved. If an institution’s actual repayment rate exceeded its predicted rate by a meaningful margin—defined as at least 10 students and 3 percentage points—it would become eligible to receive bonus payments. This requirement would ensure that small institutions would not receive a bonus solely if one or two more students repaid beyond expectations. 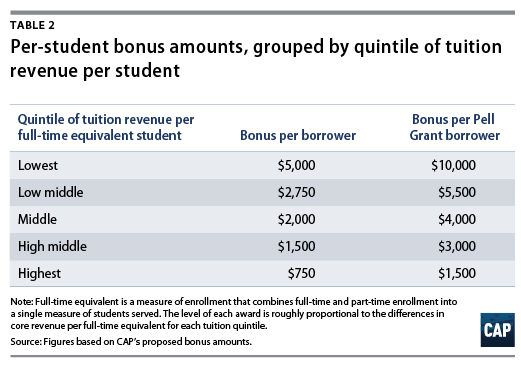 The size of the per-student bonus should vary based upon the amount of tuition that a school receives for each full-time equivalent student—a measure of enrollment that accounts for both full- and part-time students. Schools would be grouped into quintiles and receive bonuses between $750 and $5,000 per students who are not Pell Grant recipients and $1,500 to $10,000 for students who are. Larger amounts should go to schools that receive less in tuition per student on the grounds that they have fewer resources to draw upon in order to improve results and also reward those schools for having lower prices. Choosing tuition as a measure of institutional economic circumstances is also better than other options such as revenue per student because it rewards schools that have lower out-of-pocket prices. Table 2 shows how the bonus amounts would vary by quintile. An example illustrates how this bonus would work. Let’s say the University of the United States has a predicted repayment rate of 60 percent across its 500 borrowers, meaning that 300 borrowers are expected to repay their loans. In actuality, 350 end up repaying, a rate of 70 percent. Because it is in the lowest group of tuition revenue per student, it would receive the full bonus of $5,000 per student for the 50 additional people repaying loans, or $250,000. Using the same method for Pell Grant recipients, let’s say the school produced 15 more Pell Grant recipients repaying loans than expected, which would result in an additional $150,000, or $10,000 per student. All told, the school would earn a bonus of $400,000. Because each institution would be held to expectations that take their own circumstances into account, no school would face excessively difficult performance bars. At the same time, this bonus approach is intentionally designed to reward institutions that exceed expectations, particularly at scale. This is a notable departure from many other postsecondary reward systems based on outcomes, such as the performance-based funding systems that exist in some states.31 In many of those schemes, institutions simply receive credit for each graduate produced. Such programs may end up handing out large amounts of money to institutions solely because of their size. Larger schools naturally have more graduates and thus earn more money, even if their success rate is not particularly impressive. Awarding bonuses on a per-student basis also would ensure that larger rewards go to places that produce greater successes. Given equal expected and actual repayment rates, a larger school would receive greater financial rewards than a smaller one—an important recognition that it matters if more lives are positively affected. A large institution also could end up with a greater award than a smaller one even if it outperforms its expected rate by less. This, in effect, would give schools two paths for taking in more funds: succeeding at a higher rate or succeeding with more students. Awarding bonuses on a per-student basis also would ensure that larger rewards go to places that produce greater successes. CAP’s proposed bonus system would also ensure that an institution’s work with Pell Grant recipients would get special attention. These individuals would in effect be counted twice. First, they would be included in the overall predicted repayment rate for a school. Second, they would be counted separately in a Pell Grant recipient repayment rate, which would earn double the bonus amount. This means that high-impact work with Pell Grant recipients would be rewarded with a much larger bonus. Probably the single biggest challenge with this proposed bonus system is also the facet that would make it work the best: basing awards off of a predicted repayment rate. The process of predicting the repayment rate would inherently be less clear to institutional leaders than the risk-sharing system discussed earlier. Because the model depends on factors both within and outside of schools’ control, institutional leaders will not be able to know upfront the exact performance level they need to achieve in order to receive a bonus. This could make it harder for schools to create a plan to increase their bonuses. Additionally, handing out money based on predictions can make the specifications underlying the model a contested topic. Slight changes in the model could mean that a somewhat different mix of schools receives a bonus.32 To address this concern, data scientists at the Department of Education should determine the final model and allow opportunities for stakeholder input. The benefits of using a predicted repayment rate, however, outweigh the drawbacks. Several of these benefits have already been discussed above, but using a more complex way of generating bonuses would also make the system harder to game. The best way for an institution to do better is to strive for improved outcomes for all students. Estimated effects of the proposed risk-sharing and bonus system suggest that the typical results in most sectors would be manageable. For instance, the median public four-year institution would face relatively minimal payments of just more than $100,000. While this amount may seem large, very few schools in the public four-year sector face payments that approach even 1 percent of their loan volume. In fact, according to our calculations, the median institution in this group would pay an amount equaling just two-tenths of a percent of the average federal loans received. 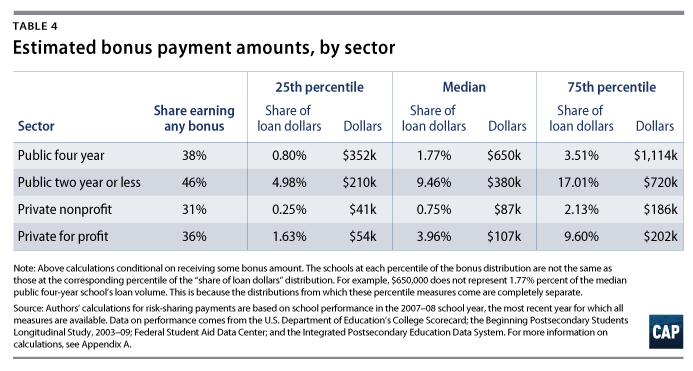 The typical risk-sharing payment would fall even further when considering the fact that more than one-third of these schools would likely receive a bonus to counteract these payments. Private nonprofit four-year schools would pay even less, a result of their generally affluent student bodies and favorable loan outcomes. They would, however, be less likely to earn a bonus because they already have high expected repayment rates that are more difficult to exceed. Community colleges and private for-profit institutions would face the greatest effects of a risk-sharing system. At community colleges, the typical risk-sharing amount would be roughly 2 percent of the median federal loan balance that such schools receive each year. While this may sound high, it is important to recall that only a small share of students at these schools actually borrow. As a result, the risk-sharing payment would be a much smaller proportion of total federal aid or total revenue. Community colleges are also the ones most likely to benefit from the bonus system, with nearly half of them expected to receive a reward. The result is that 45 percent of community colleges are expected, on net, to end up with a bonus of around 7 percent of their federal loan amount. Forty-five percent of community colleges are expected, on net, to end up with a bonus. For-profit colleges, meanwhile, would face the largest risk-sharing payments of any sector at roughly 3 percent of loan balances. Given that these institutions are highly dependent on loan dollars, this percentage is likely to have more of an effect than the slightly lower number would have on community colleges. The larger risk-sharing payments are not a result of any intentional policy to target these institutions. Rather, it reflects the fact that for-profit colleges generally charge high prices and produce poor outcomes. Larger risk-sharing payments would hold in spite of the presence of bonus dollars, which are calculated in such a way that should help schools, such as private for-profit colleges, that enroll high numbers of low-income students or other predictors of loan-repayment difficulty. For instance, just 27 percent of for-profit schools are expected to earn a net bonus, the second lowest rate of any sector. While this model includes several approximations and estimations, it excludes one key part of the proposal: risk-sharing payments based on student loan nonrepayment. There were not enough available data to model this category. It also only models risk-sharing payments related to undergraduate borrowing, while the proposed system would include loans for all levels of postsecondary education. For similar reasons, the modeled bonus payments also rely upon a slightly different type of repayment rate than the one suggested in the proposal. This model uses repayment rates from College Scorecard, which defines successful repayment as any borrower who does not default and has paid down at least $1 in principal since leaving school. Ideally, the repayment measure would be a stronger test that considers progress toward eventual retirement of the debt—not just avoidance of principal growth. This could mean that modeled bonuses would not exactly match actual results if CAP’s proposal became law. Overall, the model estimates that the median public or private for-profit institution would face a risk-sharing payment between $104,000 and $113,000. Private nonprofit institutions would pay a good deal less—a median of $37,000—mostly because many institutions in this category are prestigious four-year colleges or universities whose students are wealthier and therefore less likely to struggle with repayment. Calculating risk-sharing payments as a share of federal loan dollars received is a better way to understand the effect of these charges. For instance, a risk-sharing payment of $100,000 would cause greater difficulties for a school that serves 100 students and receives $200,000 from the loan program than one with 10,000 students that receives $10 million. Therefore, a payment-to-loans ratio—the estimated risk-sharing payment as a percentage of federal loan dollars received in the most recent year—provides a helpful way to contextualize risk-sharing figures.33 For example, a school with a risk-sharing payment of $115,000 and total federal loan dollars of $5 million would have a payment-to-loans ratio of 2.3 percent. When viewed in context, the estimated risk-sharing payments are quite reasonable. The median public two-year college would face a risk-sharing payment equal to 2 percent of federal loan dollars received, while the typical private for-profit would pay 3 percent. Even at the 75th percentile, payments would still be well below 10 percent of loan dollars received. The payments that would be required of community colleges demand some additional context. While community colleges may appear to be making the largest payments in terms of dollars, the very low borrowing rates—and corresponding low levels of total federal loans—at these schools means that the payments would represent a very small share of the federal aid received each year. For instance, the median school in this group in terms of payment ratio would pay just 0.78 percent of its federal grant and loan dollars received. By contrast, the greater reliance on loans at for-profit colleges means that the median school’s payment ratio implies that its payment would represent 1.65 percent of the its federal loan and grant aid received. The model predicts that roughly one-third of institutions would receive a bonus, including nearly half of community colleges. Among those that receive a bonus, the median amount would range from around $100,000 in the nonprofit and for-profit sectors, $380,000 at public two-year schools, and nearly $700,000 at public four-year institutions. When looking at the distribution of these risk-sharing payments from the government to schools as a share of federal loan dollars received, the median institution would be receiving roughly three-quarters of a percent at nonprofit institutions, 10 percent at community colleges, and 4 percent at private for-profit colleges. Overall, these amounts should be large enough to get institutions’ attention, while remaining a relatively minor element of university finances. The size of this proposal’s bonuses would also ensure that institutions have a powerful incentive to enroll and do well by students facing the biggest repayment risks. 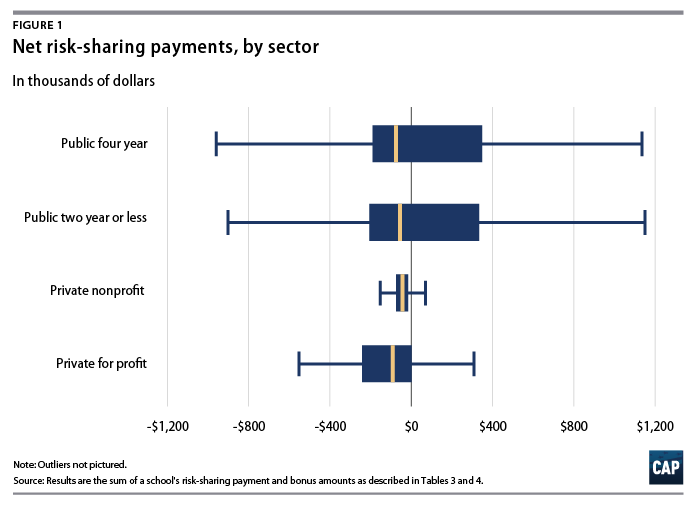 After subtracting bonus amounts from risk-sharing payments, we estimate that just more than half of schools would face a net payment, while the remainder would get a bonus. As Figure 1 shows, each sector has a different range of outcomes for its institutions, with a wide spread of payments owed or received in public institutions and a narrower spread at private nonprofit and for-profit schools. 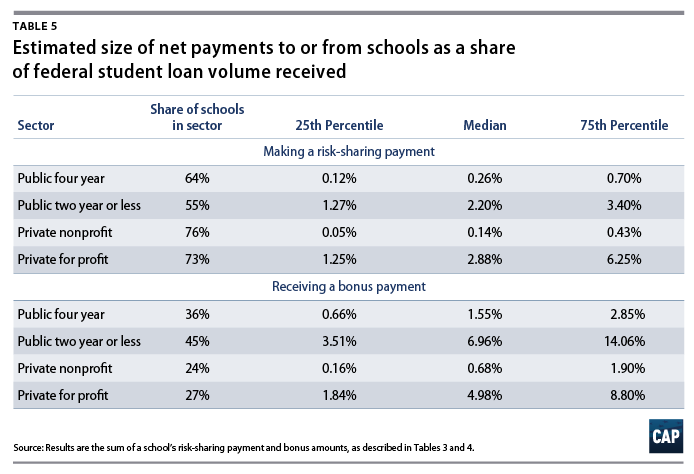 As Table 5 shows, schools that receive a bonus would typically end up with awards that are between two and six times the size of other institutions’ risk-sharing payments, when viewed as a proportion of their loan volume. For example, a public two-year school with a bonus-to-loans ratio at the median for its sector would receive an award equal to 7 percent of the average amount of federal loans received. 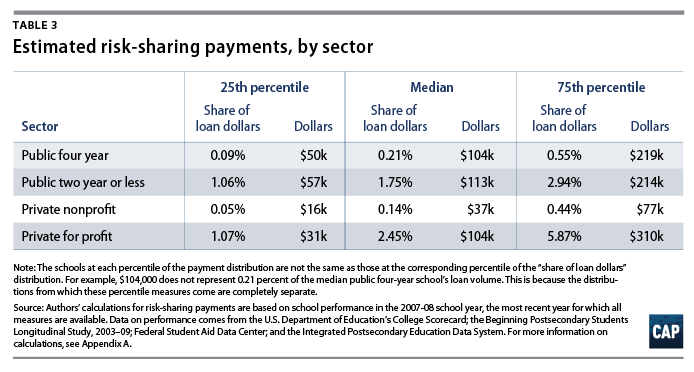 By contrast, a public two-year school at the median of its sector’s payment-to-loans ratio distribution would make a payment equal to about 2 percent of its federal loan volume. This again suggests that the combination of payments and bonuses is properly calibrated to truly reward those schools that do well without overly harming those that do not. Overall, these results again reiterate that in order to make the risk-sharing system work, it is important to include a bonus system to reward institutions that do well by vulnerable students. Absent these bonuses, hundreds of institutions—particularly community colleges—would be asked to make unfair risk-sharing payments that fail to acknowledge that the school did better than expected. The rewards of a good college education are shared among the student whose life improves, the institution that needs revenue to do its important work, and society at large, which thrives on educated citizens with good jobs. So too must every type of stakeholder involved share the risks that come with borrowing to pay for that education. Institutions cannot get off risk-free while borrowers and taxpayers face significant consequences whenever the hope for a college education and middle-class life crumbles into default or nonpayment. The proposal in this report presents a straightforward solution whereby institutions would have skin in the game. Institutions would have stronger incentives to help their student borrowers succeed. To protect against the concern that institutions may avoid riskier students, institutions that exceed expectations with vulnerable populations would earn rewards, even if their overall results were not among the best. The result would be a system that acknowledges that student loan repayment is a shared responsibility in which everyone—students, schools, and the federal government—must do their part. This report proposes to base risk-sharing payments on two measures: a student loan default rate and a nonrepayment rate. Data limitations meant that only default rate results for undergraduate borrowers could be modeled. Estimating default rates required relying on the only available source of information about loan performance based upon educational attainment: student loan repayment rates from College Scorecard for students who entered repayment in the 2007 and 2008 federal fiscal years. These data report separate three-year repayment rates for students who did or did not complete their chosen program. They do not, however, report separate repayment rates based upon the type of credential a student earned. Repayment rates by educational attainment were combined with each school’s cohort default rate data for students who entered repayment in the 2009 federal fiscal year, the closest year available to match the only cohort for which we have necessary withdrawal information, to generate an estimated default rate for graduates and dropouts. This required assuming that the ratio between a school’s overall repayment rate and the rate for its graduates and dropouts would be the same as the ratio between its overall default rate and the results for graduates and dropouts and that the default rate for students entering repayment in 2009 fairly approximates the rate for students leaving school in 2007 and 2008, whose data we lack. For example, if the repayment rate overall is 70 percent of the repayment rate for graduates—meaning that students who finish repay at a higher rate—then the model assumes that the default rate for graduates is 70 percent of the overall default rate. This means that graduates are less likely to default than a school’s overall rate. Similarly, if the repayment rate for all students is 120 percent of the repayment rate for dropouts—meaning that dropouts are less likely to repay—the model assumes that the default rate for dropouts is 120 percent of the overall rate. This means that dropouts are more likely to default than a school’s overall rate. This approach turned an institution’s default rate into two separate estimates of the rate at which students are likely to default based upon whether they graduated or dropped out. Figuring out how many borrowers graduated or dropped out was the next step in creating the model. This was done using data from the College Scorecard. The model multiplied the number of borrowers by the percentage of borrowers who completed school, either at their original or another institution, to get an estimate of the total number of graduates. It used a similar calculation to estimate the number of indebted dropouts. In cases where the College Scorecard data did not include data on the number of graduates or dropouts who borrowed, the model instead used the analogous figures for all students who received federal financial aid. If data were not available, then the model combined data from the same institution across multiple years to generate an estimate. If that still did not work, then the model filled in the missing value with an average withdrawal or completion rate for all students who received federal financial aid across all years for which data were available. After obtaining counts for the number of borrowers who graduated or dropped out, the model multiplied those numbers by the default rates generated earlier to get an estimate of the total number of defaulted borrowers within each attainment category. An example illustrates how this math works. Let’s say that the College Scorecard data report that a school has 1,000 borrowers, of whom 60 percent finish and 40 percent drop out. In addition, earlier estimates suggest that the school’s default rate was 10 percent for graduates and 20 percent for dropouts. Based upon this, the model would estimate that the school had 60 graduates who defaulted—600 multiplied by 10 percent—and 80 dropouts who defaulted—400 multiplied by 20 percent. The final step in evaluating defaulted loan payments is figuring out the total amount of dollars in default by attainment category within an institution. Unfortunately, there were no data available to calculate debt levels for each institution. Instead, the model used nationally representative survey data from the Beginning Postsecondary Students Longitudinal Study to estimate defaulted loan amounts for dropouts and graduates by the following school sectors: public four year, nonprofit four year, public two year, proprietary, and other. This means that the model assumed all defaulted students within a given institution type have the same loan balances. Multiplying the defaulted loan balance per student by the number of estimated defaulters in each attainment status produced a total defaulted loan balance for each institution. An institution’s estimated risk-sharing payment is the result of a simple equation. For each attainment category, the model multiplied the total amount of student loan dollars in default by the default rate for that category. It then adds the payment amounts for dropouts and graduates to get a total amount. For example, if a school has $250,000 in default for dropouts and a default rate of 25 percent, then it faces a payment of $62,500. If that same school’s graduates have $50,000 in default and a default rate of 5 percent, then the risk-sharing payment would increase an additional $2,500 for a total amount of $65,000. The model generated a predicted repayment rate using a simple linear regression model with institutional five-year repayment rates for students entering repayment in 2009 and 2010, measured in 2014 and 2015, as the dependent variable. The repayment rate is regressed on the proportion of first-generation college students, Pell Grant recipients, and dependent students at the institution; the predominant degree granted; the local unemployment rate in the five years following the first separation year, in this case, 2009; undergraduate enrollment at the institution in the 2009-10 school year; the average income of entering independent and dependent students in 2009-10; and the racial composition of the institution. The regression also includes state fixed effects and indicators for whether the institution falls into any of the minority-serving institution categories used by the Department of Education. This includes historically black colleges or universities, Hispanic-serving institutions, or tribal colleges, among others. The Pell Grant recipient repayment rate uses the same model except with the five-year repayment rate for recipients of a Pell Grant entering repayment in 2009 and 2010, measured in 2014 and 2015. Using the relationships determined in these regressions, the model calculated the predicted or fitted values for each institution. These predictions serve as the benchmark for judging a school’s performance. The difference between the observed repayment rate in the College Scorecard data and the predicted repayment rate serves as the basis for bonus calculations. If the institution’s repayment rates for Pell Grant recipients or non-Pell Grant recipients exceeded its predicted repayment rates by at least 3 percentage points and at least 10 students, it would receive the appropriate dollar allocation for each of those students. Schools are grouped into five equal groups, or quintiles, based on their level of tuition revenue per full-time equivalent student in order to determine the exact per-student bonus amount available to them. The data for this calculation come from the Department of Education’s Integrated Postsecondary Education Data System. Because the total tuition revenue at a school is as much a function of its size as its price, the model divided this amount by the number of full-time equivalent students. This strikes a balance between giving a college credit for having part-time students while recognizing that the amount of tuition paid by one part-time student is not the same as what one full-time student pays. As Figure A1 shows, each sector has a much different share of its institutions in each of the tuition revenue quintiles. 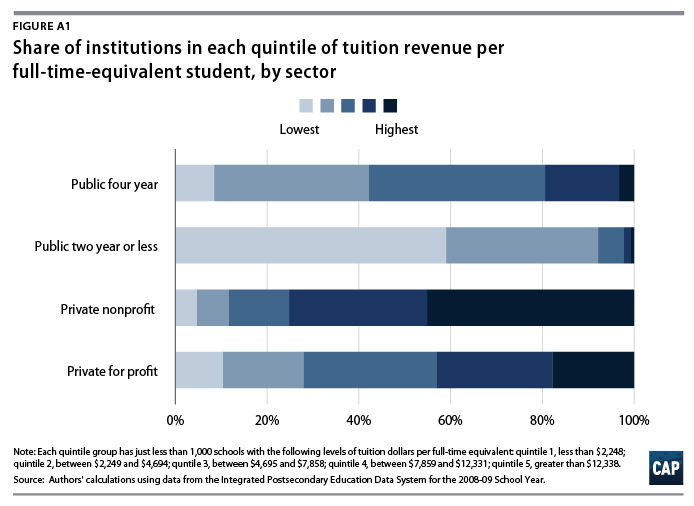 For example, while more than half of public two-year institutions are in the lowest quintile of tuition revenue per full-time equivalent student—and virtually all schools in the sector are in the bottom two quintiles—very few public four-year, nonprofit, or for-profit schools are in this group. Meanwhile, a large proportion of nonprofit schools are in the top quintile group, meaning that they are only eligible for the lowest per-student bonus amount. The treatment of graduate and undergraduate students in IPEDS finance data creates another challenge. Because IPEDS does not separate tuition paid by undergraduate students from tuition paid by graduate students, the data used here include graduate student enrollment. Because graduate school tends to be more expensive than undergraduate programs, this could have artificially driven up the level of tuition revenue per student for our purposes. The average tuition revenue per student within each quintile forms the basis of calculating the per-student bonus for schools in a given category. The model started by determining the appropriate maximum award, which would go to institutions in the lowest tuition revenue quintile. Bonuses for schools in other quintiles were set at amounts equal to the relative percentage between tuition revenue per students in the lowest quintile. In other words, if the average tuition revenue per student in the highest quintile is 50 percent above the figure for the lowest, then the bonus for that quintile is 50 percent of the maximum. The model also rounded these amounts up to the nearest $250. To learn more about or replicate our findings, you can find our detailed Stata code here and output from our calculations here. All data for this project is publicly available and can be found at the sources listed in the report. CJ Libassi is a Policy Analyst at the Center. This report is part of a series of papers on higher education risk sharing commissioned by the Center for American Progress with support from the Bill & Melinda Gates Foundation and Lumina Foundation. The views expressed in this report do not represent the views of the foundations, their officers, or their employees.